"I just wanted to say a really big thank you for our stay last week. You have a great chalet that made us all feel like we were sharing somebody's home in the Alps. Really well stocked, super tidy and clean, we could not want for anything (and the upstairs family room was a fantastic bonus!). 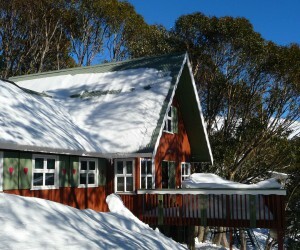 An absolute pleasure to stay there - great location which could only be improved by access when there is more snow!!! Still, despite the lack of it, we all skied every day and actually got blizzard conditions for half day Thursday which my 4 year old thought was the bees knees. Ski school was very productive. 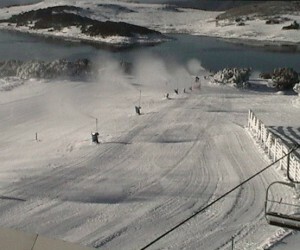 All the kids were skiing down Wombats Ramble by the end of the week! Thank you once again and hope to stay again one day." "Red Onion was a fantastic venue for our two families to stay in. The kids loved to hang out after a days skiing in the attic lounge with the great TV and sound system. The kitchen was supplied with every utensil you could need as well as pantry basics like herbs, spices, cooking oil etc. The location was also great and we could ski to the lifts and home in the afternoon. Thanks George and Di we had a great week and look forward to visiting Red Onion again." 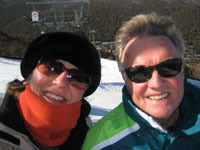 "We are one of the couples that spent the past week in your residence, Red Onion at Falls Creek. We want to thank you for a pleasurable stay; a great spot, handy to everything in the Village. You have catered for all our needs and using the kitchen was easy with all that you provide. The weather was amazing with lots of snowfalls which was an extra treat for all and especially for some first timers to the snow fields. 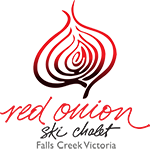 We will be recommending Red Onion to others and hope to visit again one day with our children and grandchildren when they are a little older. Thank you for a great holiday destination, everything was fantastic." "Just a short thank you note. Red Onion was great we all enjoyed our stay there and will recommend it to family and friends. 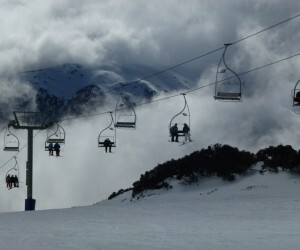 All our expectations for our week at Falls Creek were met, especially a fresh snow fall." "We love Red Onion it has been our saviour at the end of a cold day you come home to a cosy comfortable house! Thank you!" "We had a wonderful week at Red Onion. Absolutely every possible need was met as this chalet is thoroughly and thoughtfully appointed. A home away from home. Hoping to be back next year!" We had a brilliant week at Red Onion and already planning on going again in future years. Thanks to George and Diana for such an easy process and a beautiful spot. Our family, of 2 very young children, parents, grandparents & great grandparent, found the Red Onion ideal for a vacation in the snow. The Chalet is warm & inviting. The owners & manager were excellent with communication, and had provided everything we could of wished - including a high chair! We had a wonderful week in the snow at Red Onion - thank you! Now that we are home I just wanted to say thank you for providing easily the most welcoming accommodation we have ever stayed in. Even the knives are sharp! Loved the pyrolux roasting pan. Just the thing for my rib roast. Red Onion is a fabulous family home away from home.